The city sits about five kilometers from Azerbaijan.. It seems that the road from Vanadzor to Noyemberian passes through a fairy tale of high mountains covered with forests. The Debed River flows to the right of the road, while a railway runs on the left side. Noyemberian comes into view, a city located only five kilometers from the border with Azerbaijan. The weather is warm as Spring. It seems as if the blood orange is the symbol of this region. Each garden is full of ripened and yellowish fruits. Seventy-four year old Shavo is a tinsmith from neighboring Koti village but he works in Noyemberian, helping to reconstruct the House of Culture. Im glad I have work. My son and grandson work with me here. Its not good that not everybody has work, he says worriedly. Everybody in Noyemberian thinks about finding work. Deputy Mayor Grisha Gulkanyan says that people used to work in a machinery plant, in a cheese factory or on collective farms. Today each person is alone with his land and cattle. 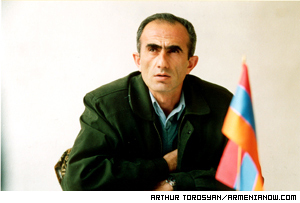 Although Noyemberian stands on the edge of forests, many residents have no firewood for winter. Today one cubic meter of wood costs 5,000 drams (about $9) and one family can use up 10-15 cubic meters during winter. How can they buy wood? It is forbidden to cut trees in the forests and few people can afford to use gas,| says Gulkanyan. Saleswoman Araksia says her people are "pliable". The Noyemberian province of Tavush region consists of 19 villages. Some 6,000 people live in Noyemberian itself, with 5,000 in Koghb and 3,500 in Berdavan. Zorakan, a border village, 13 kilometers from Noyemberian, is completely repopulated with refugees from Azerbaijan. The deputy mayor says that 100-150 families have left the city in recent years, while another 150-200 families have seen individual members depart for Russia. Locals insist that they have no desire to work abroad. Norik, a 50-year-old shoemaker, assures that he would never give up the opportunity to earn one dram in his native land for 10 drams abroad. But when it becomes impossible to earn even that one dram then they have no choice but to leave. When residents of Noyemberian describe themselves, they make comparisons with the wonderful nature surrounding the city. 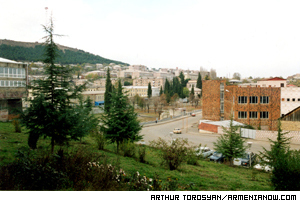 In 1990-1991 the first shells exploded in Noyemberian. Locals say that they were warned to expect attacks but it still came as a shock. People were going to see what was happening without thinking of the extreme danger. During one day 120 shells were dropped on the city. During those years nothing could stop people. The most important thing was to protect the homeland. We used to be offended with each other saying, why he takes that gun and not me? As a result of bombing, the city suffered not only human victims but it also suffered emotionally, says Gulkanyan. The fertile lands of Noyemberian, which once helped its people to live, are now on frontier territories. Today these lands are mined, under fire and unused. Our peach-trees and red orange trees are there now. Peaches of Gogveli are especially well known. 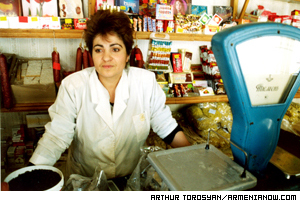 Sometimes it happened when people went there and were blown up, says Araksia. The deputy mayor says border towns like his are strategic. Gulkanyan says that he heard on television that by an order of the President 15 million drams (about $26,000) was allotted to Tavush and Lori regions for de-mining work, after which lands can be used again. One of the major problems facing the city will have been resolved this year, when the Government provides money for families whose apartments were damaged as a result of a 1997 earthquake of magnitude seven. Sums of $1,200 or $1,050 are being alloted to residents according to the level of damage they suffered. The deputy mayor assures that several communities of Noyemberian province can produce good crops if a project to collect water can be brought to life. Such a project was on the books during Soviet times, but stopped with independence. We have much water in mountains. If we can manage to make that water flow down to our settlements then the problem of irrigation water will be resolved for many communities. We expect that promises made by the Government will come true, he says. Anyway, today the sky above Noyemberian is peaceful. The sounds of exploding mines are not heard now, people simply need a little attention.